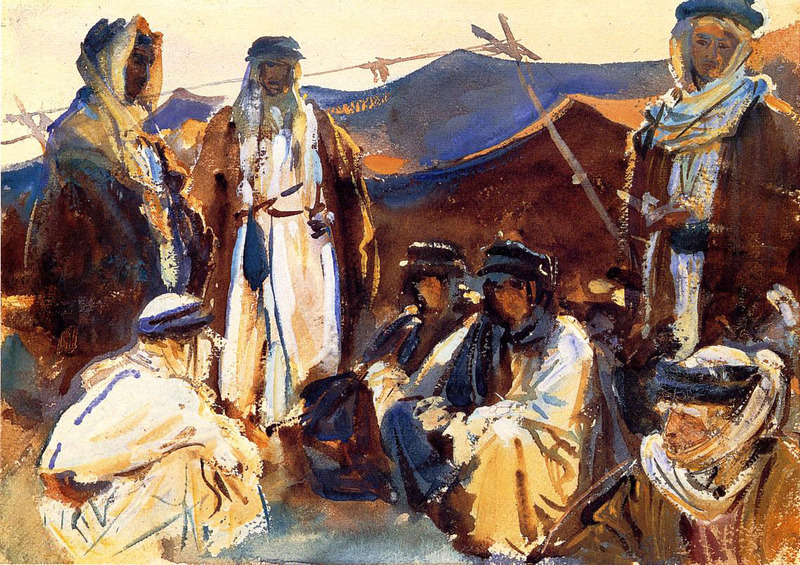 John Singer Sargent, Bedouin Camp (1905-6), watercolour on paper, 25.4 x 35.7 cm, Brooklyn Museum, New York. WikiArt. 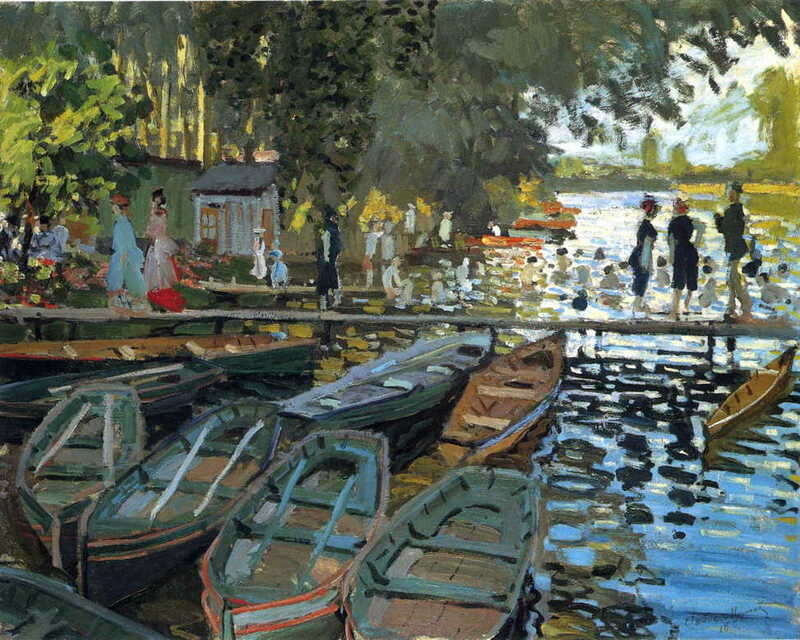 I here conclude my quest for an unofficial history of visible brushstrokes in paintings, in reaching Monet, other Impressionists, and Post-Impressionism. Last time I was surprised to find quite a painterly style in the late eighteenth century works of Francesco Guardi, saw abundant free brushstrokes in the sketches and studies – but not finished works – of John Constable, observed gestural marks in Turner’s later oil paintings, and saw the road to Impressionist style with Corot, Jongkind, and a late painting by Delacroix. No single painting (or artist) marked the inception of full Impressionist style in brushstrokes, as we saw in Corot and Jongkind in the previous article, but Monet’s classic Bathers at la Grenouillère (1869) is certainly an early example. Here, each brushstroke adds form and detail: the figures, parts of the empty boats, dark broken reflections on the water, foliage, and so on. This is the evolution of marks from their previous use in sketches, and is directly representational in intention. I will refer to this type of mark, therefore, as formative. Claude Monet (1840-1926), The Lindens of Poissy (1882), oil on canvas, 80.7 × 65 cm, Private collection. Wikimedia Commons. 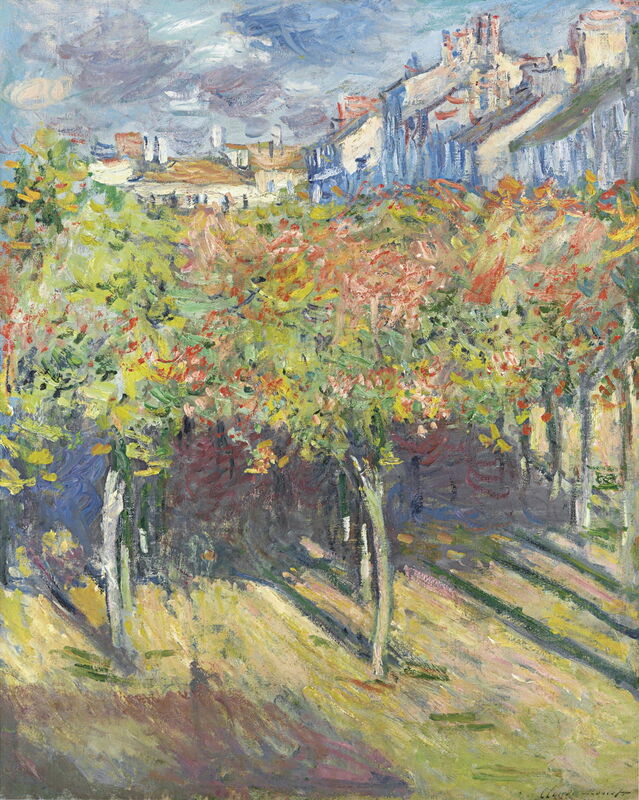 Formative marks can also be rendered very freely, as if in a hurried sketch, shown in Monet’s The Lindens of Poissy (1882). Sometimes this reflected the truth that the painting had been brushed in a rush, or it could be used as an atmospheric device. It is hard, without detailed analyses of the paint layers, to know which. Giovanni Boldini, Lady in a Red Jacket (1878), pastel on paper, 100 x 73 cm, Private collection. WikiArt. 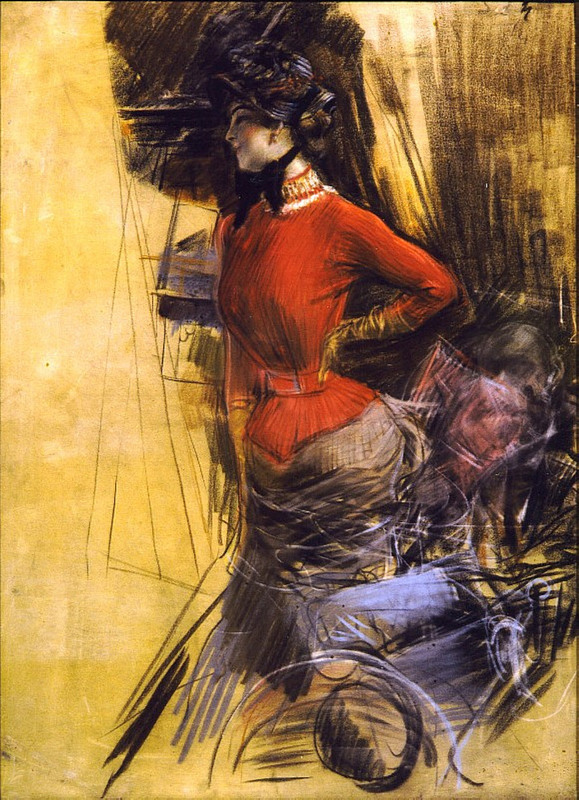 Individual artists also used stylised formative marks as part of their style: here, the ‘Master of Swish’, Giovanni Boldini uses sweeping marks in pastels, in his Lady in a Red Jacket (1878). His oil paintings employed similar style. John Singer Sargent also made intensely gestural marks, particularly in his watercolour sketches, such as Bedouin Camp (1905-6). Viewed individually or in small groups, we cannot discern what they form, but once we look at the whole painting, they appear full of ‘character’. 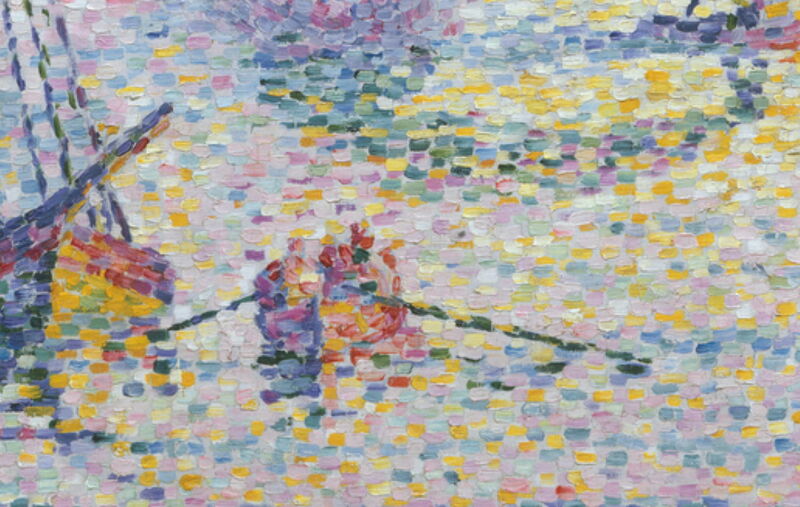 Following Seurat’s theoretical studies, the Neo-Impressionists used a completely different form of mark, the spot of bright colour, which assembled with hundreds of thousands or millions of other spots or dots to create the image in the painting. 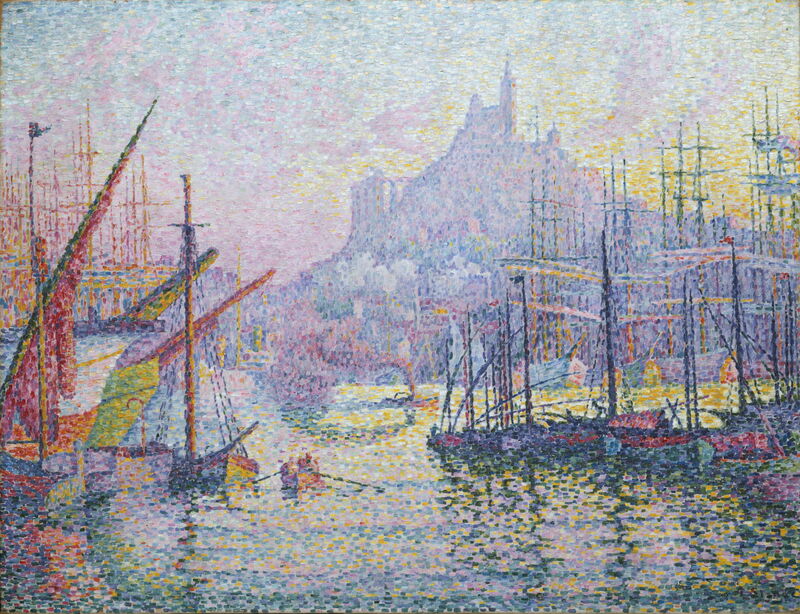 This late Divisionist painting by Signac, Notre-Dame-de-la-Garde (La Bonne-Mère), Marseilles (1905-6) is in fact made up from short and tiny brushstrokes, as revealed in the detail below. Different Divisionists at different times used different types and sizes of mark, but generally their intention was that the viewer would not see the individual marks at all, only the optical effect which they produced. However, in some Divisionist paintings the marks have grown to become small tiles of colour, and more obvious to the viewer. Vincent van Gogh (1853–1890), Blossoming Chestnut Tree (1887), oil on canvas, 56 x 46.5 cm, Van Gogh Museum, Amsterdam. Wikimedia Commons. Marks are also widely used representationally to impart texture. 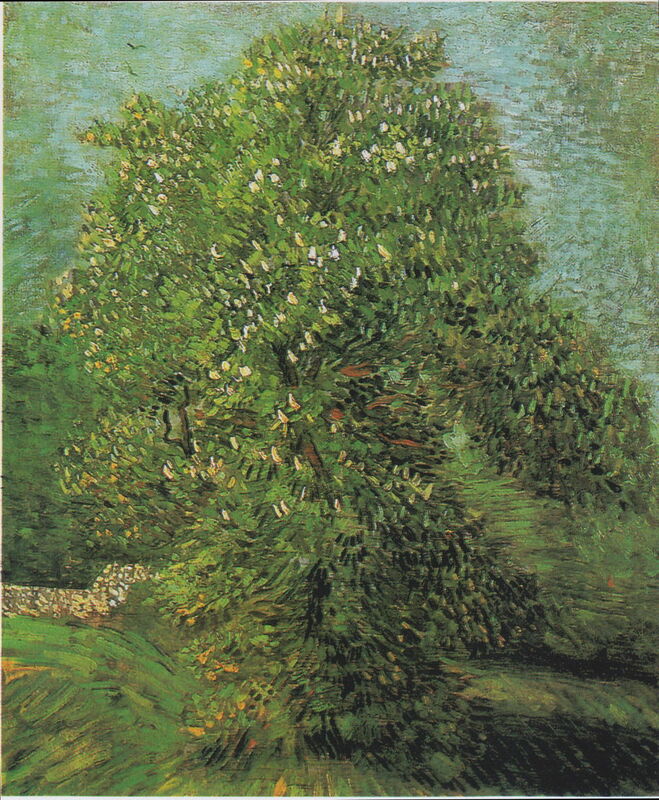 Although his earlier paintings do not appear to have used marks in any novel way, Vincent van Gogh’s Blossoming Chestnut Tree (1887) is a departure. The chestnut tree here is only demarcated from the background – the grass below, and trees behind – by discontinuity in the structure and orientation of the marks. Throughout this painting, the marks are well organised, and starting to become important in their own right. 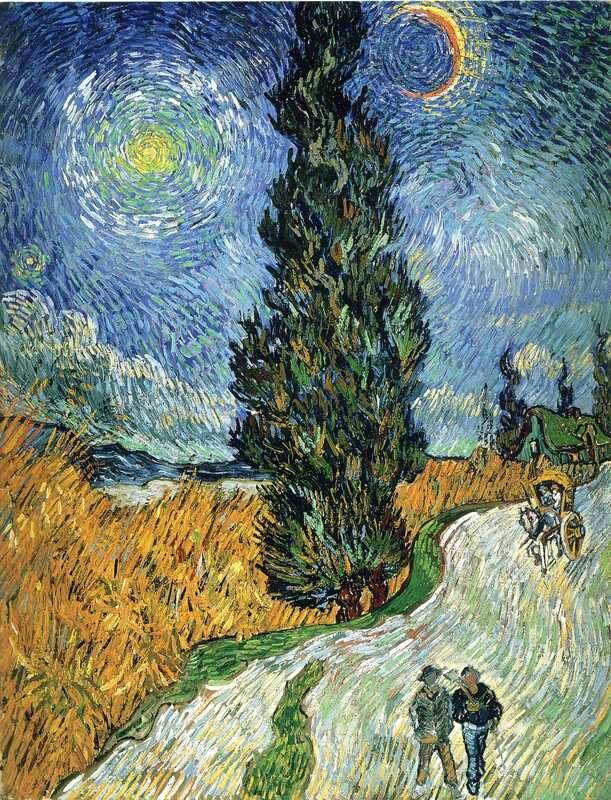 Vincent van Gogh (1853–1890), Road with Cypress and Star (1890), oil on canvas, 92 x 73 cm, Kröller-Müller Museum, Otterlo. WikiArt. This self-organisation of marks reached a peak in some of van Gogh’s late works, including the famous Road with Cypress and Star (1890), painted just two months before his death. His swirling brushstrokes rise from the cypress tree to form halos around the crescent moon and solitary star. Paul Cézanne (1839–1906), Les Peupliers (Poplars) (1879–80), oil on canvas, 65 x 80 cm, Musée d’Orsay, Paris. Wikimedia Commons. During Cézanne’s Impressionist phase, his brushstrokes were fairly conventionally formative, as were those of his mentor, Pissarro. By the end of this phase, though, Cézanne started to use his ‘constructive stroke’, in which arbitrarily patterned marks were used to form patches of colour, from which the painting was composed. 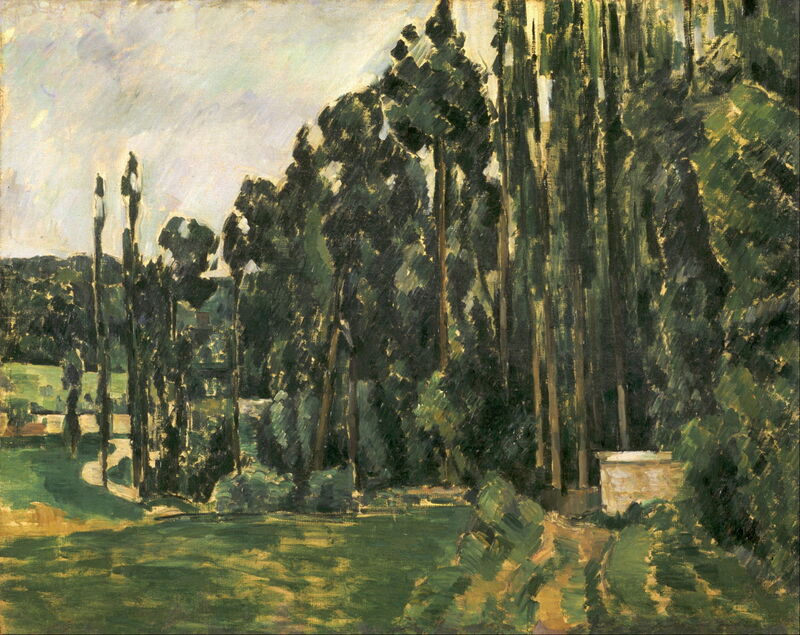 In his Poplars (1879-80), Cézanne used different orientations of mark, but most of those used for foliage of the poplars were orientated diagonally, at an angle of about 45˚, irrespective of underlying form. Indeed, their independence from form tends to make his constructive stroke a central part of the dissolution of form seen in his later work. Paul Cézanne (1839–1906), Sous-bois (Wood) (1900–02), oil on canvas, 81 x 64.5 cm, Fondation Beyeler, Riehen/Basel, Switzerland. Wikimedia Commons. 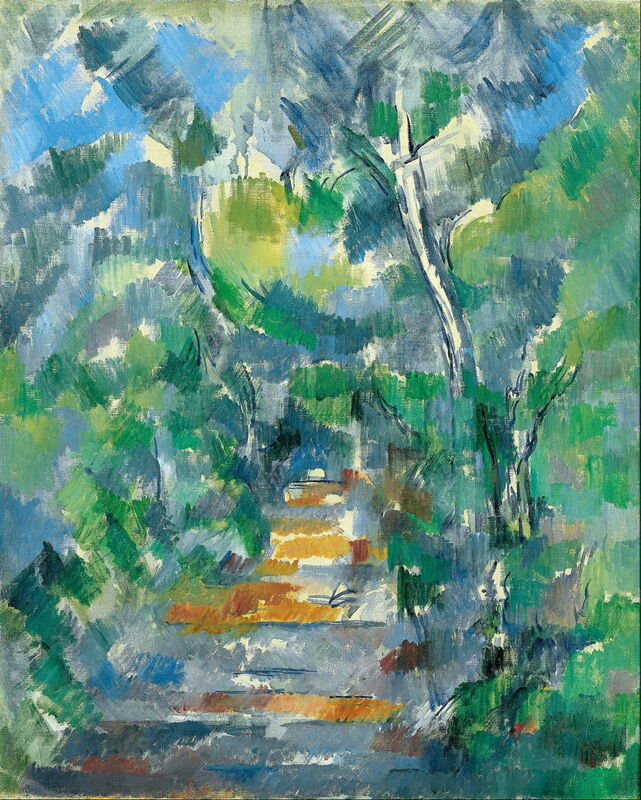 In Cézanne’s Wood (1900–2), the whole picture surface has become a patchwork of shapes formed from the constructive stroke. This was inevitably taken by others to point the way to increasing abstraction, Cubism, and other expressions of modernism. However Cézanne’s limited written accounts, and reports of his words by others, stress that he intended to represent his sensations in a realistic way, and to express form by way of colour. the constructive stroke, which is independent of form. I am sure that there are many others. For me the biggest puzzle in all this is how a painter can work close to the canvas, making marks, which then assemble into the whole painting as seen by the viewer. Yes, most painters repeatedly stand back and look at the overall optical effect which they are producing. However I cannot help feeling that a gestural painter must somehow be able to mentally visualise how those gestures will appear when viewing the whole painting. It is as if the hand and painting (action) part of the brain is happy working 20 cm from the plane of the painting, while the watching part of the brain is several metres back, and looking on. As these marks become more gestural, squiggles and blobs which seem almost independent of the forms within the painting, the task of making the marks and mentally assembling them into the whole appears to become even more of a challenge. It is also unclear what drives the form of those gestural marks, if it is not the form of the objects which they depict. The next time that you see a painting composed largely of brushstrokes and other gestural marks, stand close enough to paint it, and see how different it looks from several metres back. Making such a painting really is an art. Posted in Painting and tagged Boldini, brushstrokes, Cézanne, gesture, Impressionism, knife, mark-making, Monet, Neo-Impressionism, painting, Post-impressionism, Sargent, Signac, van Gogh. Bookmark the permalink. Further examples of the visual dilemma – Frank Auerbach and Leon Kossoff, particularly the portraits. Yes. There is a lot of more recent work which I would love to bring into this, the problem being that of showing images of paintings here. Unfortunately because of copyright law, unless I obtain the artists’ permissions, I would probably be in breach of the law.